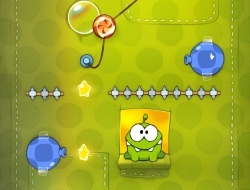 This game is from cut the rope game series, where you just have to cut the rope. Just kidding, it's not that simple, is one of that skill games where you have to be prepared for every obstacle which is going to stand in your way. Every level has a difficulty, but once you reach it, you should do it with all stars collected. None of those frog games can put you in a difficult position, that why you must try this game. All these frogs are hungry and they need you to feed them, if not they are going to be upset. Make sure you have a strategy when you cut the rope and the possibility you choose will lead you to the next level with the biggest score. What are you waiting for? Tests your skills and come to play. Cut the Rope 10.00 between 0 and 10 based on 1 votes.